This interview appeared originally in Burroughs Bulletin #52. It is reprinted here with the permission of the author. Tarzan of the Apes given to him by ERB about 1940. Photo by Frank Puncer: Los Angeles ~ July 10, 2001. 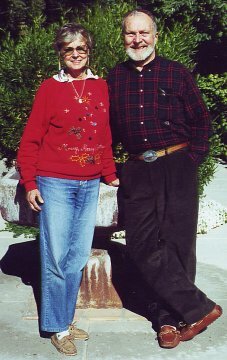 In August of 2001 I received a phone call from Lee Chase, who had just returned from Los Angeles from Sedona, Arizona where his sister, Caryl Lee, had recently passed away. 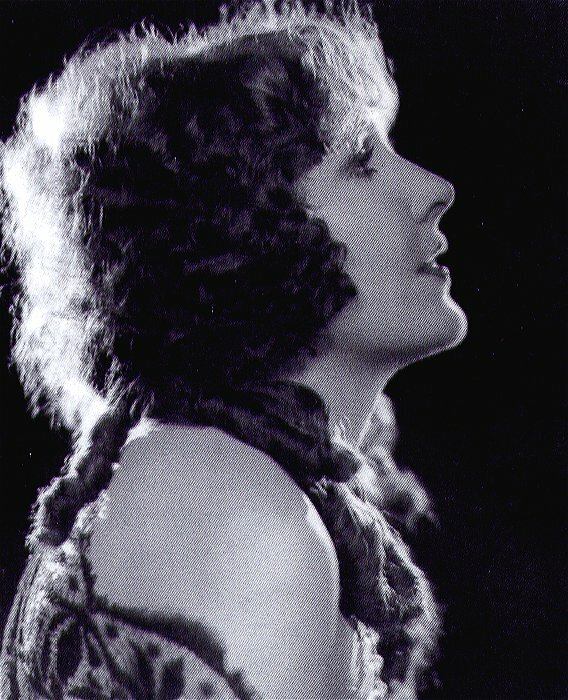 Lee had brought home with him a scrapbook containing photographs and mementos that had belonged to his mother, Florence Gilbert -- silent film actress and second wife of Edgar Rice Burroughs. Lee also brought home a box filled with Edgar Rice Burroughs's books that had belonged to his mother. The books had been gifts from Ed to Florence over a period of more than a decade. Almost all of the books were adorned with Florence Gilbert's bookplates inside the front covers. Many of them also contained personal inscriptions from Ed Burroughs to Florence. FRANK: Thank you for inviting me back. It was a year ago today (July 10, 2001) when we conducted your first interview for The Burroughs Bulletin. LEE: Yes, I enjoyed that. And you're welcome to ask whatever else might come to mind concerning mother and Ebbie and I'll try to be of help. FRANK: I was listening to the interview that Irwin Porges and his wife Cele conducted with your mother in May of 1969. 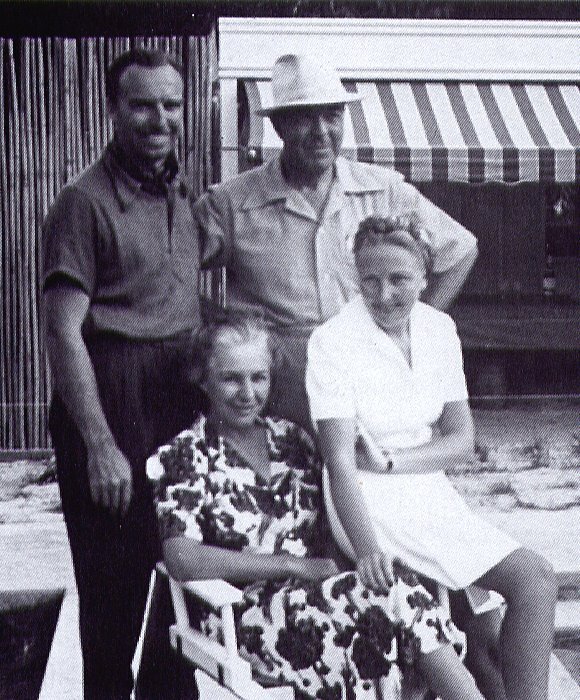 The Porges asked dozens of good questions and your mother's responses are quite enlightening. However, one question I kept hoping would come up in that interview, but never did, is whether your mother ever read any of Edgar Rice Burroughs's books; and if so, what she thought of them? LEE: Well, yes, she did. She was a very, very avid reader her whole life. Whether it was a book-of-the-month club or something from the local lending library, she was constantly finishing one book and picking up the next. She always had a book. She read Ebbie's stuff -- definitely. FRANK: Did she ever mention her impressions of any of his stories. LEE: She liked Ebbie's books. But she wondered at one time how he could have written so many stories set in Africa without ever having been there. She could understand how he'd never been to Mars. He'd never been anywhere, never traveled, except of course, through the western United States. FRANK: As Irwin pointed out in his 1969 interview, Ed did get to Idaho when he was young. That got a big laugh on his tape. LEE: Yes, and he was down in Arizona in the army, places like that. FRANK: Many of his travels were made with your mother Florence while they were married. And, of course, ERB saw much of the Western Pacific as a war correspondent during World War II. 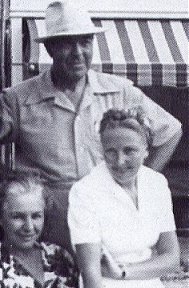 LEE: I remember mother and Ebbie drove the new 1937 Packard to New York once, then shipped it home through the Panama Canal on a ship called the "Empress of Japan." 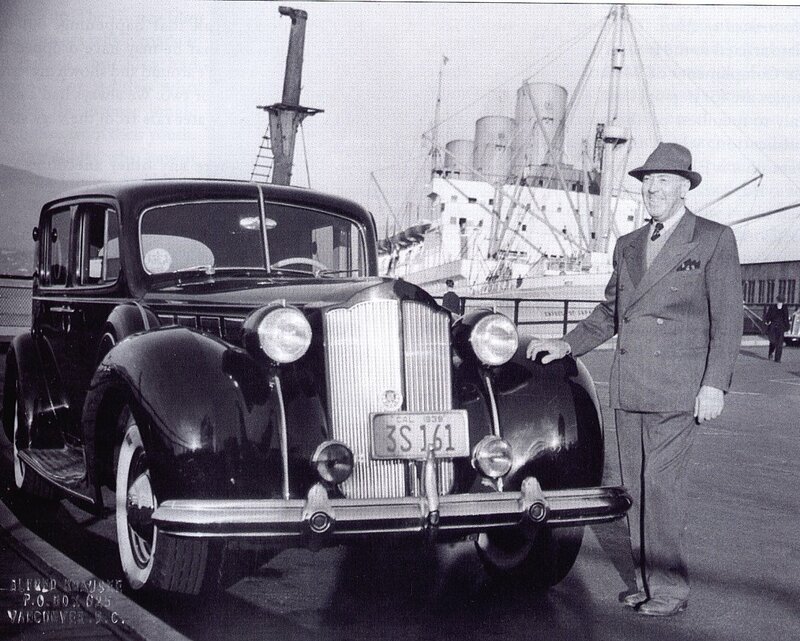 There's a picture of Ebbie standing with the Packard on a pier with the ship in the background. I remember mother describing a couple of navy fliers that buzzed the ship and one of them hit the water and that was the end of it. The only thing that came up to the surface, she said, was one tire. That happened on Gatun Lake, the big lake between the two locks of the canal. FRANK: Looking through this collection of ERB's books that belonged to your mother, I count nine that are inscribed by Ed. And I notice that she had two different bookplates. 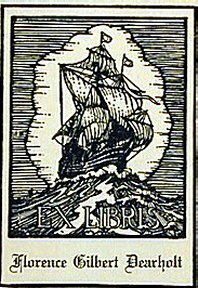 The earlier one (with a sailing ship) reads: "Ex Libris Florence Gilbert Dearholt." The later one (featuring a Hawaiian scene) reads: "Ex Libris Florence Gilbert Burroughs." The fact that your mother used personalized bookplates would seem to indicate that she loved books. LEE: Oh yes. And I'm sure she read everything she put a bookplate in. I wouldn't be surprised if she read all of Ebbie's stuff -- particularly the Tarzan books. I know she read those. She was always interested in whatever he was doing, and I would assume she read everyone of them. She really was an avid reader. FRANK: In her interview with Irwin and Cele Porges your mother reveals that ERB claimed to have fallen in love with her "almost at first sight." That's a highly romantic concept. But then, ERB revealed his romantic nature in almost all of his fiction. LEE: True. I don't know exactly when they first met, probably in 1927. But mother was unaware of Ebbie having any special feelings for her then. FRANK: These signed books span a period from 1928 through 1939. There is a first edition of Tarzan, Lord of the Jungle containing the Florence Gilbert Dearholt bookplate. The flyleaf inscription reads: "To Florence with every good wish, Edgar Rice Burroughs, Tarzana, Oct. 21, 1928." LEE: That was one of the earlier inscriptions, which were more formal. 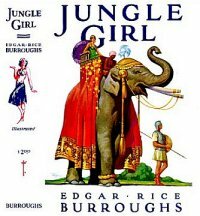 FRANK: Here is a first edition of Jungle Girl. It contains both of your mother's bookplates. The later plate, with the Diamond Head scene, has been placed over the earlier one. The inscription reads: "To Florence Dearholt with best wishes, Edgar Rice, May 6, 1932." An interesting item, though the book shows water damage. LEE: A lot of the books -- a lot of everything -- was stored out at the ranch when we went to Hawaii. The building leaked when it rained and a lot of the books and furniture were damaged. 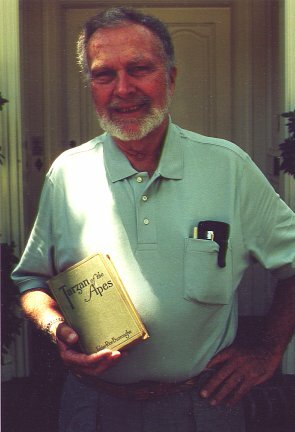 FRANK: Irwin Porges asked your mother whether ERB ever discussed any of his stories with her, and I assume he meant while he was writing them. The response was negative. Yet Ed gave Florence many copies of his books. 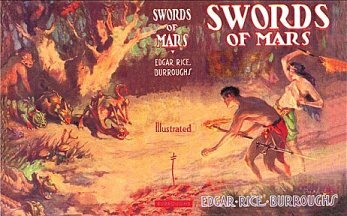 Here is a first edition of Swords of Mars, an intriguing title in that it contains a secret message: "To Florence with all my love, Ed," spelled out by stringing together the first letter of the first word in each chapter. The flyleaf inscription reads: "To Florence, all my love always, Ed, Tarzana Jan 21, 1936. LEE: Mother was very fond of that book. She found the hidden message to be an extremely romantic gesture. There was even a specially bound, light-tan pigskin covered copy that Ebbie gave to her. It was the first bound copy that came from the printer which Ebbie must have had re-covered. It's not around anymore and I don't know what became of it. It wasn't with my sister's things, and I don't believe Uncle Eddie had it either. FRANK: Let's hope it will surface someday! 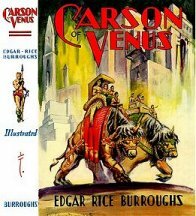 Here's a nice first edition of Carson of Venus with dust jacket. There is a plate inside the front cover that states: "This Book is the first bound copy." Beneath it is the Florence Gilbert Burroughs bookplate. The inscription reads: "Florence, with love, Ed, Jan 13, 1939." LEE: That would be one of the later books Ebbie inscribed to mother. FRANK: You mentioned on the phone that you recently re-read all these books. LEE: Yes, I did. First of all, I went through all the pocket books. Then I started through these. They were just as interesting and fascinating as they were the first time around. I started reading Burroughs's books when we were living in Kailua, Hawaii. I'd been grumbling about having nothing to read and Ebbie said: "Maybe Lee would enjoy some of my books." And he gave me some of his books to read. I was fascinated with them and read everything he ever wrote. FRANK: Did you ever discuss any of his stories with him? FRANK: Your mother mentions in the Porges interview that ERB could be rather jealous and possessive of her. She recalled an incident that occurred before they were married when she kissed an old friend of hers named Paul Speyer. Of course, it was just a friendly kiss but apparently irked Ed and he let her know about it later in some negative fashion. 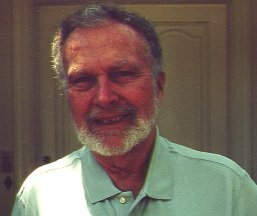 LEE: Paul and Esther Speyer and their son David were old friends of the family. They used to live over on Cherokee, near here. I can remember spending the night there several times. FRANK: Apparently the next day Ed sent Florence some American Beauty roses. LEE: Felt guilty, probably. Apologizing for his behavior. I can see that. FRANK: Your mother also relates a story about a party at the Sunset Plaza apartments where a woman named Jessie Knott came up to ERB and kissed him and was gooing over him. He was rather repulsed by that. 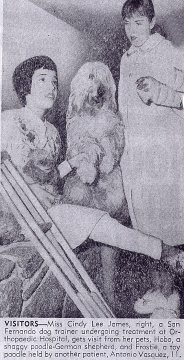 According to Florence, Ed felt that the woman had somehow made a fool of him and he "never wished to speak with her again." 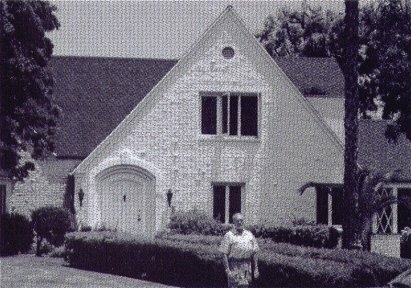 But when she phoned the Burroughs residence the next day, Ed took the telephone from Florence's hand and did speak to her again in a friendly manner. LEE: Yeah, he was not a huggy kissy person at all. As I remember, he was quite standoffish. He'd shake hands with a guy, but quickly, and that was the end of that. And with the women, he didn't give them hugs, he just didn't do it. He was very personable when speaking, either on the phone or in person. But he might have a little different opinion of you later, or before. But I don't think that I ever heard him angry with or insult anyone face-to-face. FRANK: Getting back to the books, here is a green cloth Grosset & Dunlap edition of A Princess of Mars that dates from 1926 or 1927. It contains your mother's bookplate and two inscriptions from ERB. 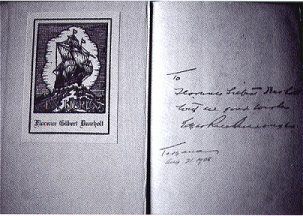 The flyleaf inscription reads: "To Florence Gilbert Dearholt with all good wishes, Edgar Rice Burroughs, Tarzana August 21, 1928." I think that is the earliest inscription here. And on the dedication page we find: "Florence -- This is the first story that I ever wrote and, I believe, one of the best -- or, it might be better to say, less worse. Ed." LEE: Yes, that sounds like him. FRANK: So he feels that A Princess of Mars is one of his best stories. Yet he also seems sensitive to the fact that literary critics of his time never seemed to think very highly of his work. LEE: He would make jokes about himself. He was self-deprecating -- he could kid other people but could also kid himself. FRANK: When Irwin Porges asked your mother what she found most appealing about ERB she replied: "What I liked about him most of all was his personality, his wonderful sense of humor which was self-derogatory." LEE: Yes, I can certainly remember his special sense of humor. FRANK: That brings us to a very fascinating photograph from your mother's scrapbook which shows Florence and Ed, presumably, at a costume party. ERB is wearing an ape suit or a gorilla suit. There is a chain around his neck that is being held by a gentleman in a high hat who is posing as Ed's "keeper." Can you tell us the story behind this photo? LEE: Sure. Mother and Ebbie had evidently been invited to a costume party. I don't think either of them cared all that much for costume parties, but that makes it even more interesting that they went to such great lengths for this one. Several days before the party a rumor spread around the house -- that would be 716 N. Rexford -- that a gorilla had escaped from the zoo. My sister and I were kids and, of course, our curiosity was aroused. I recall Ebbie telling us: "That gorilla has been seen in the neighborhood, so you kids watch out!" The servants (we had a butler, chauffeur and cook) were not in on it either. So hints were dropped for several days about this escaped gorilla and everyone was on the lookout. Then one day mother said: "Oh my God, look out in the backyard!" 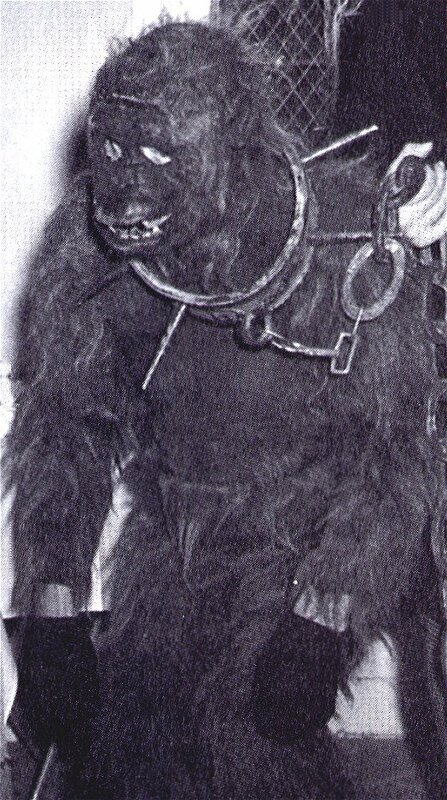 We had a rather deep backyard, as they have in Beverly Hills, and way out in he back was this gorilla. I think my heart dropped right into my shoes. My sister and I ran out of the house. The butler ran out with a hatchet that he'd found -- he was going to protect the family. I looked at mother and she was giggling and laughing. My sister caught on before I did and ran over and jumped in the gorilla's arms. Then Ebbie took off the head of the costume and there he was! He just got the biggest kick out of that. FRANK: What a classic practical joke! LEE: Oh yes, Ebbie loved it. He just pulled it on the immediate household. Then they went to the party and that's were the photograph was taken. The ape/gorilla suit might have been something he found on a movie set and decided to borrow. The chain, of course, wasn't real; it was made of plastic. Later I figured out that Ebbie really enjoyed that sort of thing. FRANK: Can you identify the other two people in the photo? LEE: No, I have no idea who they are. FRANK: That's a great story and I love the photograph. If ERB possessed an alter ego in the animal kingdom my guess is that it was probably simian. 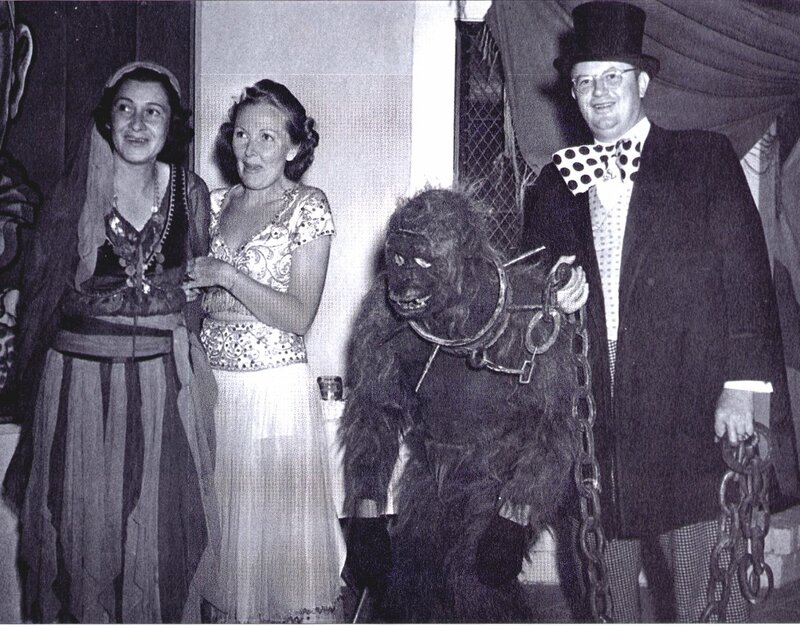 Since we can't see Ed's face, you are probably the only person alive who can positively identify that individual in the ape costume as being Edgar Rice Burroughs. FRANK: Looking at this photograph of ERB with the 1937 Packard on the pier. I'm struck by how proud and happy he appears. LEE: That's pretty much how I remember him and he certainly loved automobiles. I notice that there is a photographer's stamp on the corner of the picture that indicates it was taken in Vancouver, British Columbia. It looks more like Vancouver than Los Angeles; Ebbie has a sweater and a jacket on. So I think the "Empress of Japan" docked in Vancouver and mother and Ebbie drove home down the coast in the packard. FRANK: Your mother mentioned that she didn't think Ed was all that great of a driver. LEE: I think he thought he was. I remember once when we were on the way to Palm Springs on the old road and Ebbie got a speeding ticket. A motorcycle officer pulled him over (after a brief chase) and said something to the effect of: "Where do you think you're going, to a fire?" Ebbie was always a fast driver but didn't pay a lot of attention to what was going on around him. FRANK: Did Ed have to pay the speeding ticket, I wonder? LEE: I assume he did; he got it. FRANK: Here is another great photograph. 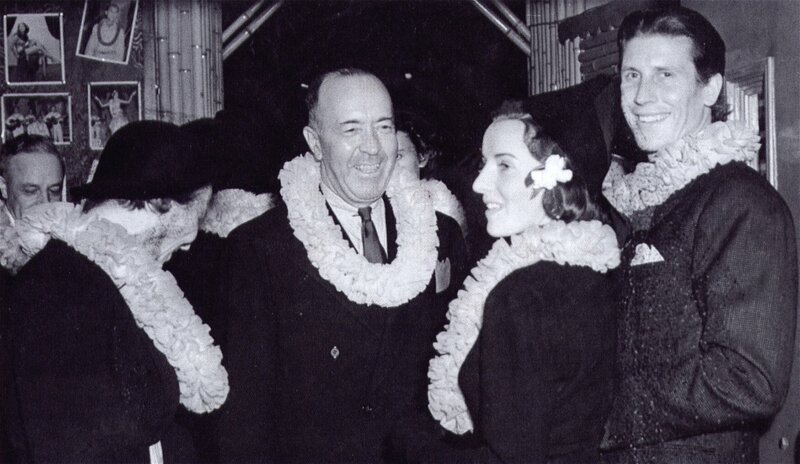 It shows Ed and Florence with Tarzan actor Glenn Morris and his new bride, all with Hawaiian leis around their necks, possibly arriving in Hawaii? LEE: It looks awfully formal for an arrival or departure; everyone is very formally dressed. Also, the leis don't look like real flowers, they appear to be crepe paper. When you arrive or leave Hawaii they load you up with dozens of leis and they're all real flowers. So my guess is that it's some kind of reception or party. It's a bit of a mystery. I would just say it's Hawaii circa 1938. FRANK: Let's look at a few more signed books. 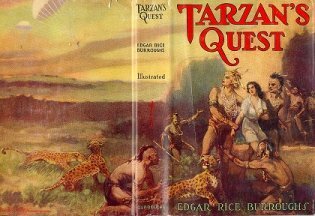 Here is a first edition with dust jacket of Tarzan's Quest. The inscription on the front flyleaf reads: "To Florence with all my love, Ed, Tarzana, August 24, 1936." LEE: The inscriptions change from "best wishes" and things to "love" after they were married. FRANK: Ed was very tactful with his inscriptions to Florence before they were married, although he and Ashton Dearholt were always friends. LEE: Oh yes, very good friends, even afterward. FRANK: Your mother mentioned in the Porges interview that even though Ed had a jealous streak, he was never, ever jealous of your father Ashton Dearholt. LEE: Well, Ashton had moved on to a different life, you know, and obviously to a different woman. So I don't think that Ebbie felt that there was any threat there. 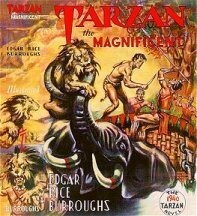 FRANK: Here is a first edition of Tarzan the Magnificent with dust jacket. 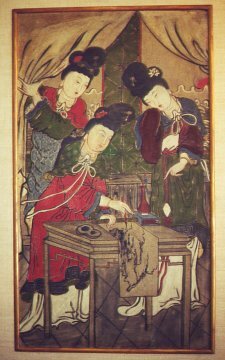 There is a plate inside the front cover that states: "This Book is the first bound copy." The flyleaf inscription reads: To Florence with love, Ed, Sept. 1,1939." LEE: That would have been Ebbie's 64th birthday. FRANK: The only foreign book in the lot is a British first edition with dust jacket of The Mastermind of Mars The book has a publisher's plate affixed to the front flyleaf that states: "With the Compliments of Methuen & Co. Ltd. These copies are for personal use, and should be shown only to members of the press before the day of publication, which is 28th September 1939." Beneath it is ERB's inscription: "To Florence with love, Ed, Tarzana, Oct. 7, 1939." LEE: That would have been an advance copy sent to Ebbie by the publisher. FRANK: You also have a unique book which contains two original poems by Ed along with accompanying water color illustrations. It's a blue cloth hardcover note book with blank pages that Ed apparently filled in while he and your mother were on vacation. The two poems are titled, "The Ballad of the B's" and "It's Ants." 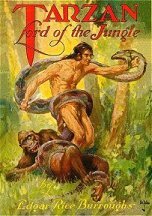 Porges described this book and printed the two poems in Chapter 23 of his 1975 biography Edgar Rice Burroughs: The Man Who Created Tarzan. But no one outside of your family and the Porges have ever actually seen the two poems in their original state, printed out in ERB's hand with the beautiful, original water colors. LEE: That book was created by Ebbie while he and mother were on a car trip out in the desert in 1937. I think they were going to Las Vegas by way of Kingman, Arizona. Auto-gypsying, so to speak I believe the car broke down at one point. One of the water colors shows the Cord automobile being pushed by hand along a narrow mountain road. I remember Ebbie making a lot of little pen drawings, sketches and water colors that I thought were quite good. He usually had some amusing verse to go along with them.  FRANK: Someday, perhaps, we can publish a limited facsimile of this rare book for the fans. LEE: Sure, if it's something they would be interested in. I don't see why not. FRANK: It was your sister, Caryl Lee, who mentioned something to Irwin and Cele Porges about Johnny Weissmuller teaching you both how to swim at the Sunset Plaza apartments. LEE: I don't recall that happening, but it's certainly possible that he may have dropped by one day when I wasn't around and shown my sister a swimming stroke or two. We always had a pool and we were both water rats from the very start. FRANK: Are there any anecdotes you would like to share with us today? LEE: Well, one time when we were living in Kailua, Ebbie found a bottle with a note inside of it that had washed up on the beach in front of the house. The note had been sent by some fisherman from one of the other Hawaiian islands. Apparently he was rather lonely or bored and just wanted to see where his note might go. He must have included return address, because Ebbie sent the man a note back telling him where the bottle had been found. He also sent along an autographed copy of one of his books. I thought that was interesting. FRANK A message found in a bottle. A fisherman's fantasy realized courtesy of Edgar Rice Burroughs. On that note we'll have to leave it until next time. Thank you again, Lee Chase! dining room of the Chase residence. another patient, Antonio Vasquez, 11. 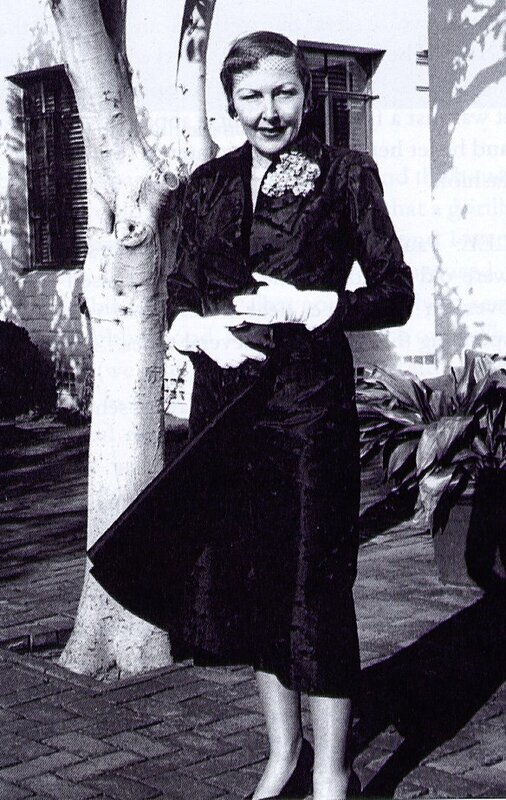 Edgar Rice Burroughs, Tarzana August 21, 1928." Florence Gilbert as a silent film star, 1925.
at the Kailua Racket Club, Oahu, Hawaii, Sept. 7, 1940. ERB dedicated Deputy Sheriff of Comanche County to Mary. ERB in ape/gorilla suit, ca. 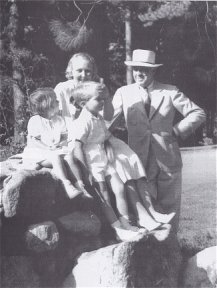 1936 ~ with Florence (centre) and unidentified couple.